Next week, Extreme Makeover: Home Edition will begin filming its most extreme makeover ever — seven homes in seven days in tornado-torn Joplin, Mo. Dallas PR specialist Cooper Smith Koch will have as much reason to celebrate as anyone associated with the show. Eight years ago, a TV producer in Los Angeles called wanting his client, Dal-Tile Corp., to donate kitchen and bath tile for a new reality remodeling show being spun from ABC’s people-transforming Extreme Makeover. Koch figured what the heck. It would be good exposure for the Dallas-based tile maker and the show was only asking for a couple of hundred dollars in product. Extreme Makeover: Home Edition is now in Season 9. The 36-year-old owner of Cooper Smith Agency has arranged on-camera roles for Dal-Tile’s products and those of his other clients in every episode since the TV phenomenon debuted. Koch has also succeeded getting building products and home decor brands trade-out appearances on just about every popular home improvement or design show on TV today — including those of DIY Network, HGTV, TLC, PBS and all of the Crashers franchises. 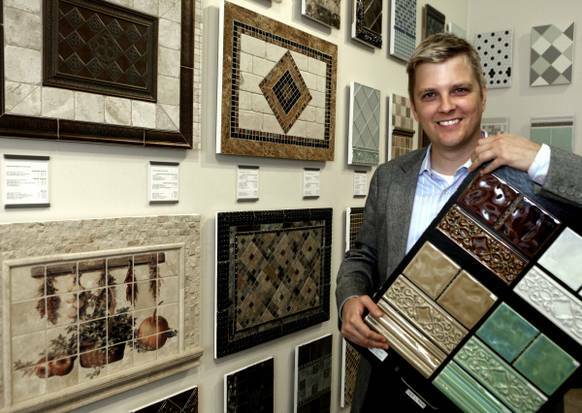 “Almost every home show needs tile because kitchens and bathrooms are the showiest rooms that they can redo,” Koch says. In addition to Daltile , he represents American Olean, Karastan Rugs, Mohawk hardwood flooring and carpet, and Warmly Yours radiant floor heating systems, as well as handful of other building products. He can relate to the families helped by Extreme Makeover. His childhood was a nomadic one of riches to rags, thanks to the energy bust that forced his family to sell its refinery business in the 1980s. His parents divorced when he was in kindergarten. Custody of him and his younger sister flipped several times. There were only three grades when he attended the same school for the entire year. He got a half-scholarship to Southern Methodist University and paid the rest with student loans and work-study, earning a degree in journalism with minors in German and statistics in 1997. He worked in the nonprofit world and for two PR agencies before opening his shop in 2002. His former boss, Gail Cooksey, allowed him to take the Dal-Tile account with him. Product placement has been his PR agency’s life raft in the economic storm. “I specialize heavily in architecture, design, construction, real estate and building products — all fabulous places to be in this recession, by the way,” he says sarcastically. He lost half of his traditional PR business in 10 days in April 2010 and had to pare his staff from nine to two and two part-timers. Then a year ago, Mohawk Industries, which owns Dal-Tile, consolidated its marketing and public relations into a single national agency. But instead of getting booted from the Dal-Tile account, he was given a leg-up to represent other Mohawk brands in product placements. He legally changed his last name — but not his agency’s — in 2010 to that of his partner, Todd Koch, a finance executive with Greyhound Lines. That year, they adopted a daughter and a son, now both 21/2. The agency’s revenue will be about $500,000 this year, down from two years ago, Koch says, but should increase substantially in 2012 when two new product-placement accounts kick in. He’s extended his traditional PR business by doing media outreach about clients’ TV appearances. Koch currently works with about 15 to 20 shows per month, often getting a number of clients on the same episode. “I’m being paid by four clients to deal with one producer,” says Koch, whose network of reality show producers continues to spread. Producers, who work on contract, tend to move from show to show, taking him along. Absolutely true, says Kim Lewis, production designer for Extreme Makeover, who oversees the design team and has worked with Koch for six seasons. A truckload of Daltile and Karastan Rugs arrived on site last week waiting for the seven simultaneous home raisings, slated to begin filming Oct. 19 for airing in November. Building one house in a week takes hour-by-hour planning. Seven in seven days gets it down to the half-minute. Lewis knew Koch would hold up his end of the bargain. Two years ago, an exterior stone supplier reneged on his donation just before a home was to be built in Mineola, Texas. Koch and Dal-Tile came to the rescue. Koch is on a monthly retainer with performance goals with Dal-Tile and American Olean. He charges other clients $500 per appearance. Clients donate products and materials directly to the shows. In return, companies get an agreed-upon few seconds of on-air exposure, sometimes with a mention or a logo shot. Like most of Koch’s clients, Dal-Tile sells its products to dealers, distributors, designers and builders, but not the public. Lori Kirk-Rolley, senior marketing director of Dal-Tile, says exposure feeds the pipeline. “It never ceases to amaze me when our customers say, ‘Oh, I know you guys. I saw you on Bad, Bad Bath [now called I Hate My Bath on DIY], or I saw you on Extreme Makeover,’” she says. “They have customers who come in for our products that they’ve seen on TV.